The weather has warmed in Northwest Michigan, the tourists are rolling in and the cherry trees are taking on a definite red hue. That can only mean one thing: festival season is upon us! With the relatively short season at the 45th parallel, the next few months are going to be jammed full of activities. 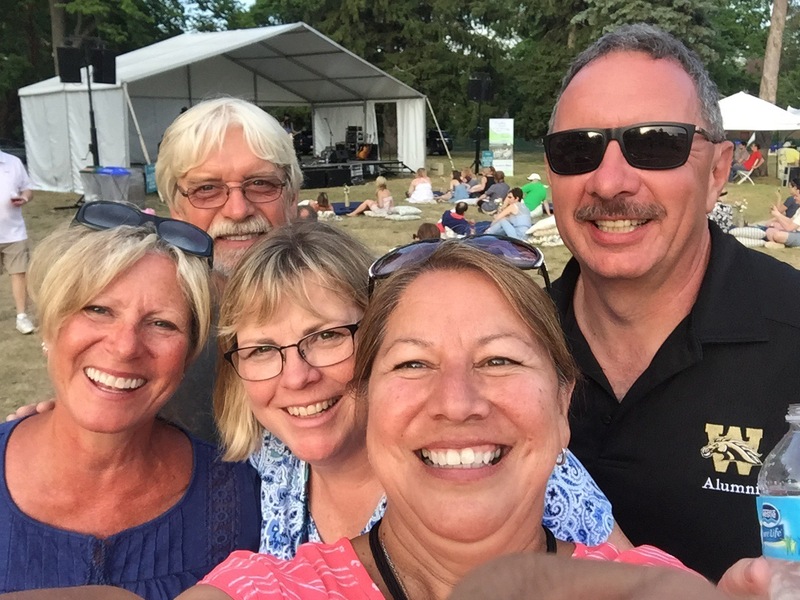 On Saturday, Diana and I went to the Traverse City Wine and Art Festival with our friends Patti and Lane. 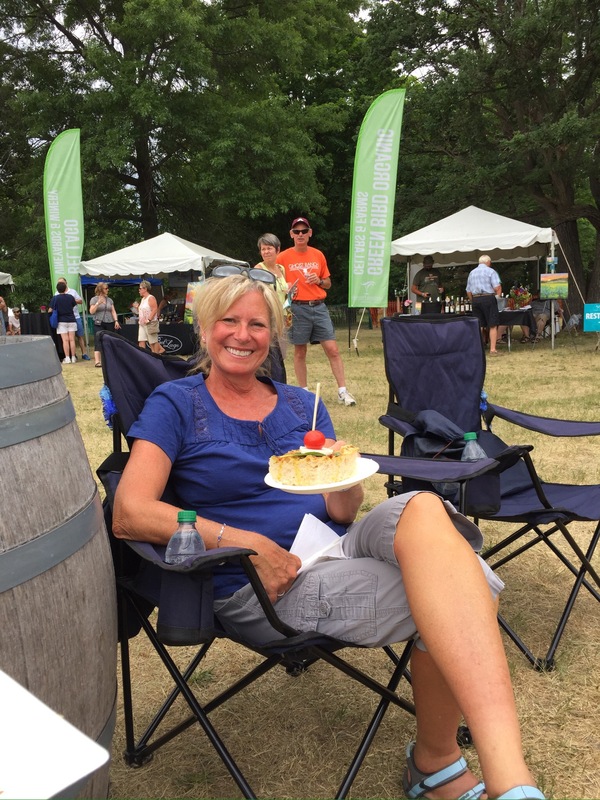 Earlier this month, on the day I was having our frame welded, Diana worked at the Leelanau Vintners Association to help them get ready for the event. Our friend Camilla works there and needed assistance on decorations. Diana also was able to enlist Patti and Lane to help. In exchange, we received tickets for the festival! Here is the trio with a sampling of their handiwork. It took them a fair amount of time to wrap each bottle in twine. They did a really nice job! Each ticket got us a stemless wine glass, eight tasting tokens and a food ticket. Additional tasting tokens and food tickets were available for purchase. Here Patti is showing off her food choice. Looks yummy! 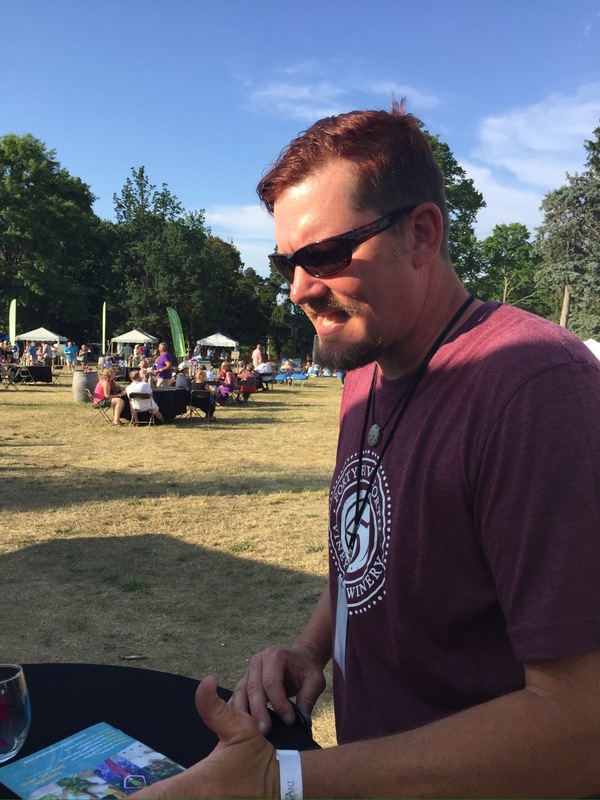 Each winery from the Leelanau Vintner’s Association had their own booth set up on the perimeter of the grounds. There were also several local artists, along with a stage featuring four music acts. We tasted several different wines, skipping some of the wineries that are close to our campground, as we get to them often enough. After that, we took a special Chardonnay tour. This was led by Jay Briggs, winemaker at 45 North Winery. Jay took us to several different booths to sample different Chardonnay offerings. Along the way, each winemaker explained their process, the types of barrels used to age the wine and so on. It’s amazing the work that goes into making wine, and no two batches are ever the same. 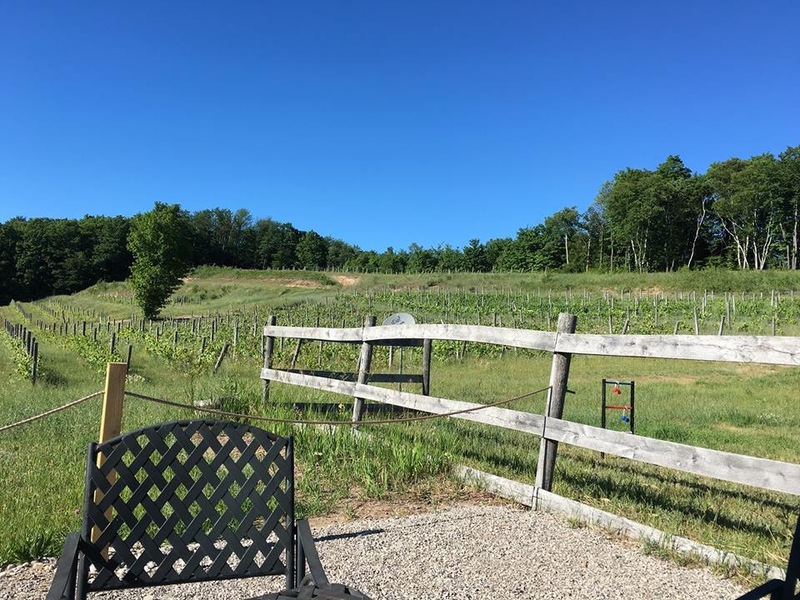 While Leelanau is prime real estate for growing grapes…that’s why there are 26 wineries here…the dynamic weather on the peninsula can make or break a crop. Another thing they do is the saberage ceremony, led again this year by Lee Lutes, winemaker from Black Star Farms. 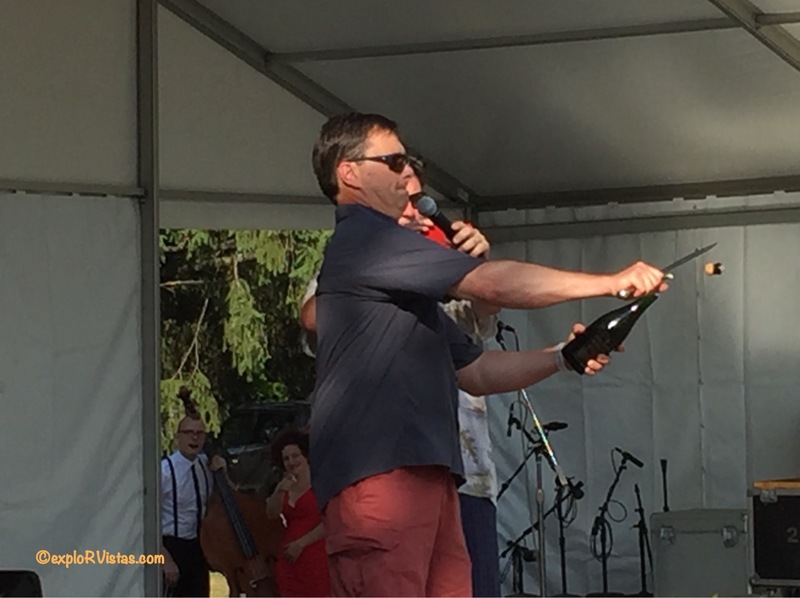 He opens a bottle of Champagne with a saber, striking it on the neck of the bottle. The day was a lot of fun, and darned if we didn’t close the place down! As an added bonus, our tickets included free tastings for the next week at the wineries. That’s quite a bonus! So on Tuesday afternoon, we went with Patti and Lane to three wineries near us. 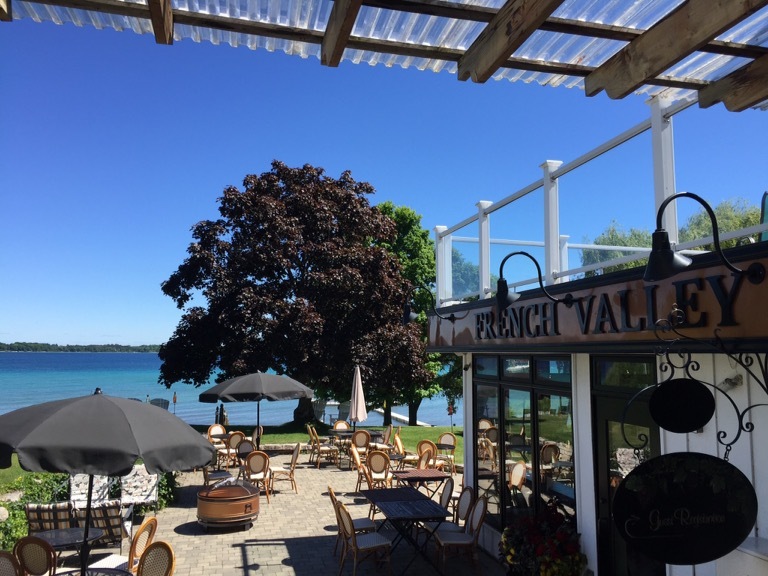 First up was French Valley. 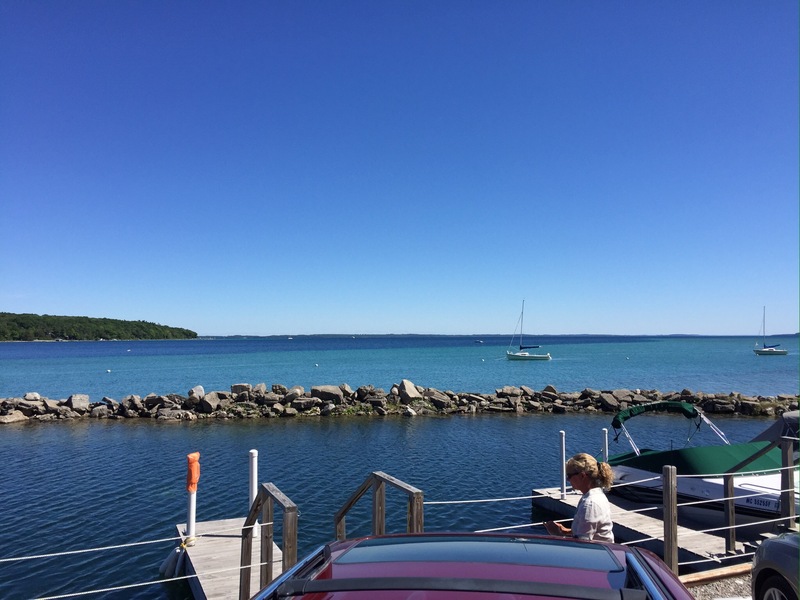 They are located on Suttons Bay, which is on the eastern side of the Leelanau Peninsula. 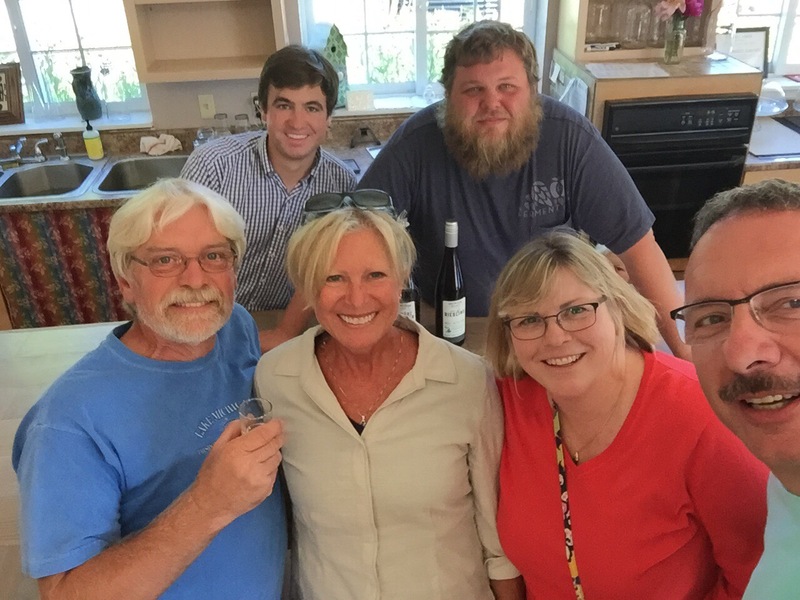 We sampled five of their wines and decided that we would be back to enjoy a bottle along with one of their wood-fired pizzas. They have an outstanding view from their lawn. Next up was Leelanau Cellars. 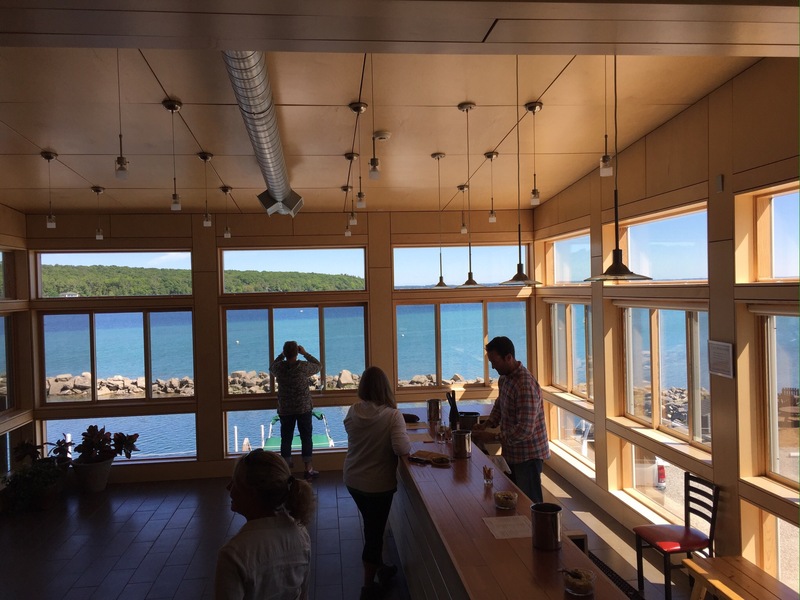 Their tasting room is a few miles north on Omena Bay. Again, we sampled five wines and ended up buying a bottle from them. Our last stop was farther north in the middle of the peninsula at Green Bird Organic Cellars and Farm. Patti took this photo of their vineyard. One of the owners explained to us how they purchased the 67 acre organic farm from the previous owner, Good Neighbor Organic. He and his business partner changed the name and are raising their families on the land with their wives. There is also a distillery on the property, owned by another friend. Quite a bit is happening with these ambitious folks. Here we are with one of the owners Ben, on the right and Bill, the owner of the distillery. These people are passionate about what they are doing. We sampled several of their products, including some of Bill’s rum. We purchased a bottle of Green Bird’s pear cider. That visit capped off a really great afternoon with our friends Patti and Lane! Our tasting tickets are good through this coming weekend, so we hope to get back out and sample a few more of the peninsula’s offerings. This weekend starts the National Cherry Festival in Traverse City, so things will be extremely busy. The Blue Angels are in town, putting on their first show since they lost one of their pilots in a crash earlier this year. 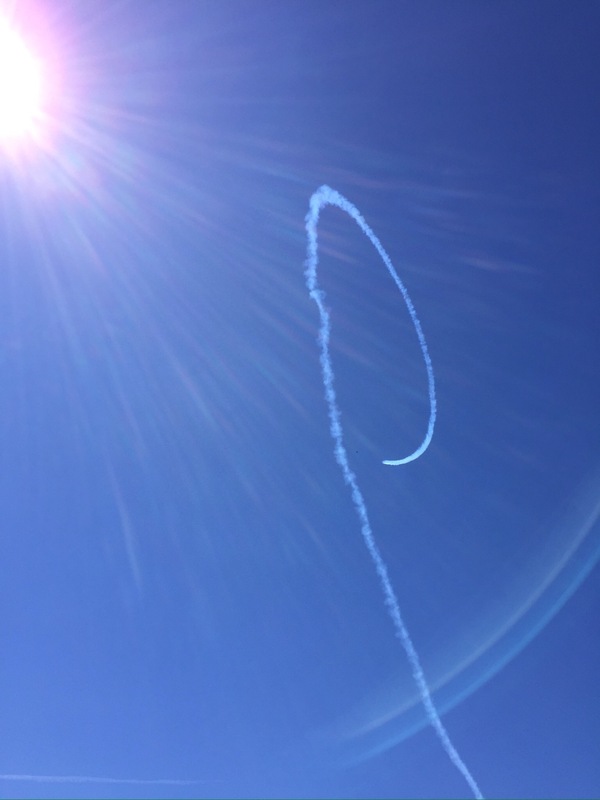 One of the planes was practicing over the campground yesterday doing barrel rolls and inside loops. We are anticipating seeing more of them today. 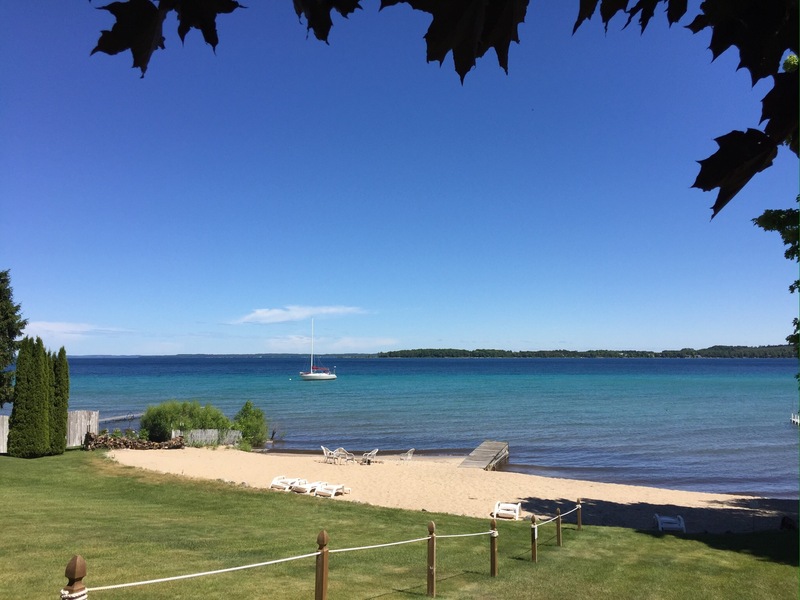 It’s been a great start to a busy festival season in Leelanau, and we are really looking forward to the next few months. If you are in the area, stop in and join the fun! Search and shop Amazon through exploRVistas here! After all this partying you’re gonna be ready for a quiet winter! With the Summeriest grounds in Milwaukee for decades we did summer festival after summer festival after summer festival. It looks like you guys are having a blast but this year we’re enjoying having a quiet season. Can’t believe I’m saying that — I’m usually the one who is wanting to go — but there you have it. Life changes. The cherries might be enough to get me over there……….. There is a bumper crop of cherries this year, Peter…and the grapes are happy also. The winemakers are hoping that the weather cooperates through harvest, as they have had a couple of rough years recently. For all the rain we are getting it’s good to see that the crops — mostly corn up here — are doing quite well with no evident storm damage. But at the moment we’ve been having rolling thunder continuously for a good 20 minutes! Send it our way….its dry here! 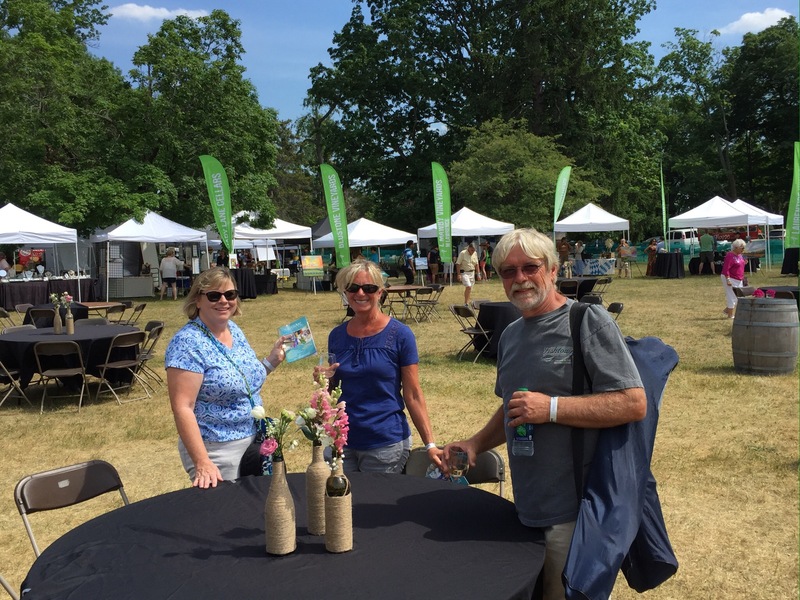 Free festival tickets and wine tours! Too much fun! Yes, I would say the tickets were earned. Still it sounds like a fun day. It sounds like you are having a wonderful time. I wasn’t aware that there are so many wineries in your area. Just another reason to visit. And those are only the ones on the Leelanau peninsula, Bonnie! There are several others on the Old Mission peninsula across the bay from us! That’s a lot of “wining” for the week, looks like a great time!